Is it time to turn to ‘no-touch’ automated room disinfection? I gave a webinar for 3M yesterday entitled ‘Is it time to turn to ‘no-touch’ automated room disinfection (NTD)?’ It was based broadly on a recent Journal of Hospital Infection review article, and you can access the slides here. The key data supporting the need for improved hospital disinfection, particularly ‘terminal disinfection’ when patients are discharged. The strengths and limitations of conventional disinfection methods, particularly in terms of reliance on the operator to ensure adequate formulation, distribution and contact time of the active agent. The potential benefits of introducing automation into the room disinfection process. Coverage of the advantages and disadvantages of the various “no-touch” automated room disinfection systems currently available. Scenarios in which NTD systems may be warranted. To summarize the rationale for using an NTD system: enhanced conventional methods are able to eliminate pathogens from surfaces, but the inherent reliance on a human operator to ensure adequate formulation, distribution and contact time of the active agent introduces variability into the process. NTD systems remove or reduce reliance on the operator for delivering hospital disinfection. However, they do not obviate the need for cleaning, so they are designed to augment rather than replace conventional methods. So when to consider an NTD system? The flow chart below (Figure 1) shows a decision tree for which cleaning and disinfection approach to take. Given their practical limitations, NTD systems are best suited to disinfection of a room after a patient colonized or infected with a pathogen has been discharged to protect the incoming patient from acquiring the pathogen left behind by the prior room occupant. A recent study of a hydrogen peroxide vapor (HPV) NTD system shows that patients admitted to rooms disinfected using HPV were 64% less likely to acquire any multidrug-resistant organism (MDRO) than patients admitted to rooms disinfected using standard methods when the prior room occupant had an MDRO. Figure 1. A disinfection decision diagram for when to consider an NTD system. a) Key pathogens associated with contamination of the environment include C. difficile, VRE, MRSA, A. baumannii, P. aeruginosa and norovirus. b) All NTD systems are applied after a cleaning step to ensure that surfaces are free from visible contamination, which is unacceptable to subsequent patients and will reduce the efficacy of the NTD disinfection. c) There is limited equivocal evidence that enhanced cleaning / disinfection in a low-risk general ward setting can reduce the spread of pathogens. I asked the audience which, if any, NTD system had been used in their hospital (Figure 2). 90% of the predominantly US based audience had not used an NTD system at all, which was a surprise. In the hospitals that had used an NTD system, there was a fairly even split between HPV and the UV systems. Figure 2. Has your hospital used an NTD system and if so, which one? Each of these systems have advantages and disadvantages, which I have tried to summarize in the following table by ranking the systems in the key categories. The hydrogen peroxide systems tend to have higher efficacy and better distribution than the UV systems. But the UV systems are faster and easier to use. Thus, there is a trade-off between efficacy / distribution and cycle time / ease of use when deciding which NTD system would be more appropriate. Table: Comparing the key features of the four commonly used NTD systems. In order to illustrate the challenges in choosing a) whether to use and NTD system and b) which to use, I presented the audience with three scenarios. In scenario 1, below, I was expecting most people to select ‘conventional methods’ or one of the UV systems, which have both been shown to reduce the burden of contamination without reliably eliminating pathogens. The sheer number of patients with MRSA colonization transferred or discharged from general medical wards means that the additional time for HPV may not be warranted. Scenario 1. What do you do when a patient who was colonized with MRSA has been discharged from a room on a general medical ward? Scenario 2 is an occasion where you want to be sure that residual contamination has been dealt with so that the incoming susceptible ICU patient will not acquire the virtually untreatable carbapenem-resistant A. baumannii. Therefore, HPV, which is associated with the elimination of pathogens from surfaces, is a rational choice. Scenario 2: What do you do when a patient who had an infection with carbapenem-resistant A. baumannii has been discharged from an ICU room? Scenario 3 is more tricky. While the likelihood of C. difficile spore contamination argues for the higher efficacy of the hydrogen peroxide systems, the number of transfers or discharges of patients with C. difficile on a surgical unit may be high, which argues for the lesser efficacy but faster cycles from the UV systems. The majority of the audience selected HPV in this scenario, considering that the combined risk of the pathogen and specialty required the elimination of C. difficile spores from the room prior to the admission of the next patient. Scenario 3: What would you do when a patient who had C. difficile infection has been discharged from a room on a surgical unit? To summarize, the use of an NTD system to augment terminal disinfection is warranted in some circumstances. The choice of NTD system will depend on a number of factors, including efficacy, distribution, ease of use, cycle time and cost. The features of the various NTD systems make them best suited to different applications, dictated by the clinical setting and the environmental-pathogenic characteristic of the target pathogen. So, is it time to turn to NTD systems? 52% of the audience voted ‘yes’ at the start of the webinar; 74% voted ‘yes’ at the end! Figure 3: Is it time to turn to ‘no-touch’ automated room disinfection? The audience were asked this question at the start and the end of the webinar, indicating a swing towards the affirmative! Article citation: Otter JA, Yezli S, Perl TM, Barbut F, French GL. Is there a role for “no-touch” automated room disinfection systems in infection prevention and control? J Hosp Infect 2013;83:1-13. Research from the Cleveland VA published in the ICHE special edition tells a fascinating story of sequential interventions to reduce environmental contamination with C. difficile. The research includes pretty much the whole battery of environmental interventions at our disposal: education of housekeepers, the introduction of a specially trained “A” team, ATP bioluminescence, fluorescent markers and UVC for “no-touch” disinfection. About the only thing missing is copper surfaces! Before we get to the interventions, let’s just reflect on the fact that somewhere between 60-70% of rooms were contaminated with C. difficile after terminal disinfection in the baseline period. It’s little wonder that admission to a room previously occupied by a patient with C. difficile increased the chances of developing C. difficile infection! Related to this, there’s some interesting thoughts at the beginning of the discussion about whether there could be a “safe” level of C. difficile contamination. I discussed this in a previous blog post here. 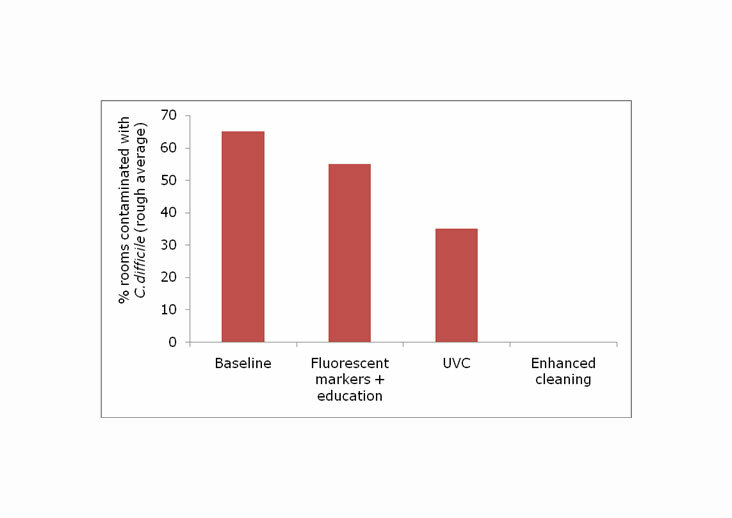 The introduction of fluorescent marking with feedback did not eliminate the C. difficile environmental contamination, with 50-60% of cultures remaining contaminated. Similarly, the introduction of a UVC “no-touch” room disinfection system for terminal disinfection did not solve the problem, with 30-40% of cultures remaining contaminated. Only when daily disinfection was performed by a dedicated team and terminal disinfection was performed by EVS supervisors and/or the infection control team was the problem finally solved and C. difficile could no longer be cultured from surfaces. It’s disappointing that the intervention that worked in eliminating C. difficile room contamination comprised improvements in both daily and terminal cleaning, so it’s not possible to determine which was most important. It seems likely that a combination of the two did the trick. Figure: sequential interventions to tackle environmental contamination with C. difficile. The study used robust microbiology methods to sample the environment, comprising swabs plated directly onto selective agar, and gauze pads from the same surfaces cultured through broth enrichment. The % positive sites from the enriched gauzes was approximately double the swabs inoculated directly onto agar, demonstrating the value of broth enrichment for environmental sampling. Another important study finding was that the effectiveness of room cleaning prior to UVC room disinfection was sub-optimal, indicating that the housekeepers were placing too much faith in the automated system, which is designed only to disinfect and not to clean. So what does this odyssey mean? Firstly that a combination of interventions can be useful, and secondly, the extraordinary lengths required to eliminate C. difficile spores from the environment. Sitzlar B, Deshpande A, Fertelli D, Kundrapu S, Sethi AK, Donskey CJ. An Environmental Disinfection Odyssey: Evaluation of Sequential Interventions to Improve Disinfection of Clostridium difficile Isolation Rooms. Infect Control Hosp Epidemiol 2013;34:459-465.